State governors under the platform of the All Progressives Congress (APC) on Tuesday night met with President Muhammadu Buhari where they congratulated him on his decision to recognize June 12 as Democracy Day. Gov. 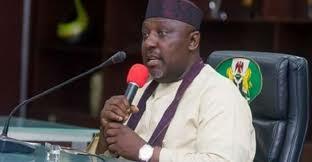 Rochas Okorocha of Imo State, who made this known to the State House correspondents after the closed door meeting with the president at the First Lady Conference Hall, Aso Rock, Abuja, said the governors also commended the president for the conferment of honours to heroes of June 12. Owojela’s Blog recalls that President Buhari had on June 6 in a statement declared that henceforth, June 12, be observed as Democracy Day in Nigeria and that some heroes of democracy be given national honours. The president fulfilled this promise on Tuesday when he conferred on late MKO Abiola the Grand Commander of the Federal Republic (Posthumous) and Alhaji Baba Gana Kingibe and late Gani Fawehinmi were also conferred with Grand Commander of the Order of the Niger. Okorocha stated that the APC governors lauded the action and foresight of President Buhari for taking steps aimed at uniting Nigerians as well as promoting political stability in the country. “We also commended Mr President on his recent outing the issue of the June 12 as Democracy Day and the honour done to Abiola. “We saw this as an opening of a new page in relationship,’’ he said. The governor also disclosed that the meeting reviewed activities concerning the APC, including the forthcoming national convention of the party. According to him, the APC is more united than ever and ready for any political eventuality.